Thanks to the box full of awesome that Greg Kushner has sent us, we're able to fill in the back-story of, uh, Zoo Story. We'll get back to Zoo Story later, but it makes sense to begin here, with the first official Unsightly tape. 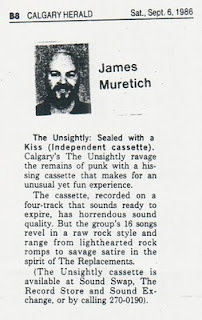 Greg and Jeff formed their first band, the Unsightly, in around 1985, and recorded a demo called "The Unsightly Can't Play" (as we don't have a copy, we're unable to verify the appropriateness of that statement) to 4-track in the CJSW production studio. After that, they added Jonn Janzen on drums, returned to CJSW and cut the tape we're featuring today. 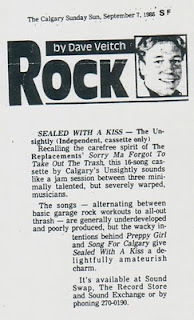 Greg has sent along a couple of press clippings of reviews the tape garnered in the local media. These don't read like either Veitch or Muretich were impressed by the tape - maybe "Song for Calgary" hit too close to home? Anyways, this is pretty stupid fun - with some great flashes of catchy pop mixed in.